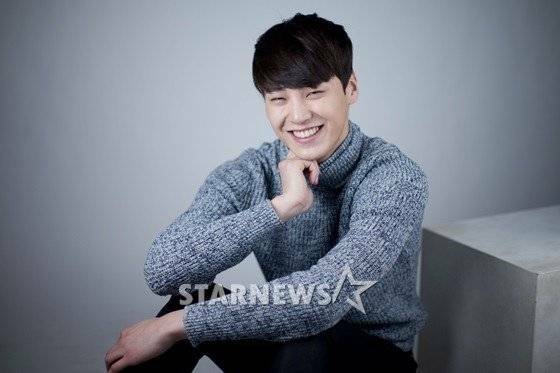 Lee Tae-hwan, "I want to be like Cha Seung-won"
Lee Tae-hwan is tall and has impressive eyes when he smiles. He's 2 years into the career and he's successfully drawn attention to himself. Lee Tae-hwan is also a member of the actor group Surprise. He starred in the tvN drama "The King of High School Manners" as Oh Tae-seok and then Kang Soo in "Pride and Prejudice". Kang Soo is an investigator from the Incheon district in the drama "Pride and Prejudice". He provided support in interrogating Park Man-geun (Jung Chan) by recalling everything he'd forgotten. It might seem a little pressurizing for a rookie but Lee Tae-hwan did it. "Pride and Prejudice" was made up of Choi Jin-hyuk, Baek Jin-hee and other great actors and actresses like Choi Min-soo, Son Chang-min and more. He would've felt the pressure even before he started acting. He claims it was awesome and great at the same time. "I met Choi Min-soo and Son Chang-min for the first time when we were making the poster. I was amazed at the fact that I was with people who I've been seeing on TV. I was nervous about acting in front of them. I was pressured but they advised me and helped me find my track". Lee Tae-hwan is just a rookie. Kang Soo added a lot of confidence and courage in him. He says he feels like he's a step more mature in being an actor. "I wondered if I could do it but after "Pride and Prejudice", I'm better at expressing myself and getting used to the set. I am confident now and I think I progressed a lot. I am sure of what I do although I still have a long way to go. This is just the beginning. I have to work harder". Lee Tae-hwan claimed he completely fell for the character of Kang Soo. He seems much brighter than the dark character of Kang Soo now. He seemed so different. He shows potential of being a different face as an actor. He claims he can't believe it's over. He feels like there's work to do with the seniors. He thanks everyone who was there with him throughout the drama. ""Pride and Prejudice" is a special drama to me. I changed my views on acting through it. I am confident that it's become a base to my future works. Thank you, to the director who made this possible and for trusting in me to carry out this big role". Lee Tae-hwan has become known thanks to "Pride and Prejudice". He always used to be called a 'member of Surprise' or 'rookie' but now he is known as Lee Tae-hwan. He used to be a model. Cha Seung-won has influenced him a lot. The reason he thought of becoming a model and an actor was because of Cha Seung-won, his role model. "I saw Cha Seung-won on a TV show once. He was running around in a mud flat and that was impressive. Then I found out he used to be a model. I became interested in this business when I found out he was a model who turned into acting and TV shows. He was amazing. I want to be like him who can be anything he wants to be". Lee Tae-hwan's start of 2015 is good. He made himself visible to the public and he's earned confidence in acting. He will not stop to progress himself. "I'm going to do my best to always seem new. I wish it's a good year for everyone and hopefully I can expand into musicals and entertainment shows". "Lee Tae-hwan, "I want to be like Cha Seung-won""
Kim Hyang-gi and Kim Sae-ron to work with writer from "Secrets"
Kim Woo-bin, "I didn't want to cause Kim Hyun-joong trouble"